Sometimes you just wake up and realize, this is what I want to build. Well so far so good, next step as always is to scribble it down on paper for later review when you are fully awake. The idea I had on paper was for a home entertainment PC, it should have a retro look, or even better, a futuristic look viewed by a person living in the 1940's. As many times before I ended up looking at Ebay for further inspiration. 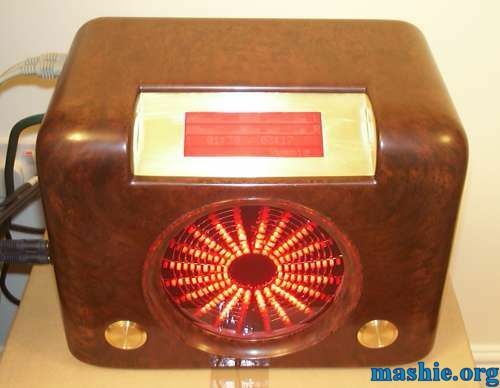 After some time looking around I finally found an interesting shape, a picture of a 1940's Bush DAC 90 tube radio was on my screen. Oh yes, this was exactly what I was looking for, a piece of brown plastic with a huge potential. My thoughts started to run away again, the square hole was easy, that one should be enough to fit a LCD. The big round hole used for the speaker was a different beast. I let an old idea pop up from back of my head, all those new fancy japanese compact stereos with complex graphical displays had always caught my eye in stores. Especially those with massive graphical spectrum analyzers... time to hit google for more research. I ended up with a webpage showing off a Velleman K4300 Spectrum Analyzer Kit. After I read about the 100 LEDs divided in 10 channels I saw one little line that almost ruined my day "This product has been discontinued". Oh dear, I sent an email to the Velleman head quarters in Belgium just to be told that they didn't have any left in stock but that I might be able to find some store that did... Time to give google a go again. I managed to locate quite a lot of places online that still had the K4300 in their price lists. Emails were sent to all of them just to be returned with the note that they were out of stock and couldn't get any more from their distributors. I had so far only searched in Europe so now it was time to source whatever I could get from anywhere around the globe. Plenty of emails later I finially found a place in Canada that still had two kits in stock. Three minutes later both of them were heading their way to UK.